Though there exists a decent hack to create Flickr slideshows and embed them inside any website, here's a much better solution called SlideRoll that's easy and fun to work with. Slideroll is like a web-based clone of Microsoft Photostory software - it lets you create slideshows of digital photographs that are your hard-drive or can fetch pictures directly from your Flickr account. The advantage of using SlideRoll is that you can also add free music loops, transition effects and text titles to your Flickr slideshows and make them more appealing. Slideroll provides a small HTML snippet to embed the Flickr slideshow in your Myspace webpage or any other blog. Alternatively, you can download Flickr slideshows to your hard drive as MPEG Video using the free Slideroll Videomaker application and later upload them directly to Youtube. 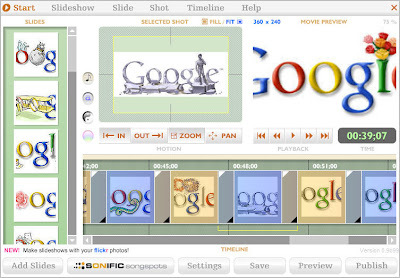 Slideroll | VideoMaker [Flickr Slideshows for MySpace or YouTube].